He said there was "hostility" in those areas and described the government's multicultural policies as divisive. It comes as the government said Muslim women would be offered assertiveness training in an attempt to fight extremism in their communities. The courses will form part of a campaign to get more Muslim participation in UK civic life. Writing in the Sunday Telegraph, Dr Nazir-Ali said there had been a worldwide resurgence of Islamic extremism, leading to young people growing up alienated from the country they lived in. It had also turned "already separate communities into 'no-go' areas". He said there had been attempts to "impose an 'Islamic' character on certain areas", for example, by amplifying the call to prayer from mosques. The Muslim Council of Britain said the mosque call was no different from church bells ringing. Naved Siddiqi, of the Islamic Society of Britain, said: "It seems like Dr Nazir-Ali is really looking for someone else to blame for the declining church attendances in Britain, and aims fire at another faith group." He added: "As for these 'no-go' areas, Dr Nazir-Ali hasn't named one that we can assess, and nor can I. "Yes, there will be many spots of social deprivation but these cut across ethnicity and faith, so religion doesn't come into it." Dr Nazir-Ali warned of a multi-faith "mish mash" as the government promoted its integration policy. He said it was "an agenda which still lacks the underpinning of a moral and spiritual vision". He said the role of chaplains in such places as hospitals, prisons and educational establishments was in jeopardy "either because of financial cuts or because the authorities want 'multi-faith' provision, without regard to the distinctively Christian character of the nation's laws, values, customs and culture". "Not only locally, but at the national level also the establishment of the Church of England is being eroded," Dr Nazir-Ali said. He added: "If it had not been for the black majority churches and the recent arrival of people from central and eastern Europe, the Christian cause in many of our cities would have looked a lost one." The new leader of the Liberal Democrats, Nick Clegg, was highly critical of the bishop's claims, describing them as "a gross caricature of reality". He told Sky News: "I strongly disagree with him. I don't think he has produced any evidence that there are really no-go areas - that is an extraordinarily inflammatory way of putting it." He added: "Clearly there is a legitimate debate to be had there, because of the rise of extremism, particularly for young men in these communities." But Conservative home affairs spokesman David Davis said the bishop had rightly drawn attention to a "deeply serious problem". He said: "The government's confused and counter-productive approach risks creating a number of closed societies instead of one open cohesive one." He said Labour's support for multiculturalism risked creating a situation of "voluntary apartheid". A Communities and Local Government spokesman said: "We need to keep this issue in its proper context. "The overwhelming majority of Muslims are peaceful, make a huge contribution to British life and find the views of a small minority of violent extremists completely abhorrent. Britain also has a proud tradition of different communities living together side by side. "But we are not complacent - the government has completely rebalanced its community cohesion strategy putting far greater emphasis on promoting integration and shared British values (as the Bishop acknowledges in his article)." Muslim youth organisation The Ramadhan Foundation said it was disturbed at the bishop's comments and urged him to step down, saying it was against the tolerant teachings of the Archbishop of Canterbury, Dr Rowan Williams. 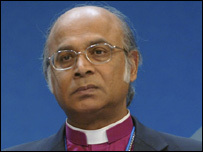 Ibrahim Mogra, of the Muslim Council of Britain's inter-faith relations committee, described the bishop's comments as "alarming". He said: "If there is no evidence he can put forward then it boils down to simple scaremongering. "It is very worrying if parts of our country become no-go areas for anybody, and it is not acceptable. "To suggest that a handful of people are beginning to create such areas where nobody else can go unless they are Muslim needs evidence to back such claims."